Which building is the most important in the world? One of the contenders for this title is St. Peter’s Basilica. This giant church tells tales about the limitless power of the religion and politics and above all – about the immense creativity of humans. History of this church starts at the Sea of Galilee in contemporary Israel. Local fisherman Simon became one of the first followers of Jesus and Jesus gave him a nickname – Peter ("cliff"). After the death of Jesus he became a leader of Christians and was actively spreading the faith in Judea, Palestine and Antioch. It is not known whether Saint Peter ever came to Rome… but according to later Christian accounts he did. May be we will never learn the truth – history too often is invented and rewritten – but according to the tradition of Church St. Peter was the first leader of Christians in Rome and thus – he was the first Pope in the main metropolis of the ancient world. According to story St. Peter was executed in 64 AD after the Great Fire of Rome when Christians were blamed for this catastrophe. He was executed at an ancient Egyptian obelisk in the Circus of Nero. It is considered that the current obelisk in St.Peter’s Square is the same witness of these tragic events. His remains were buried (again, according to unproven legends) next to the circus, in an established cemetery on Mons Vaticanus, outside the City of Rome. Here have been buried numerous victims of executions, and, due to the burial of St.Peter – numerous local Christians. Archaeological excavations took place here in 1939 and under the church were found fragments of bones wrapped in a purple and golden fabric – definitely an important burial. It was decided that these remnants belonged to Saint Peter. Large rock was placed over the grave initially and some years later Christians built small shrine here. As the Christianity became the leading religion in Rome, there arised a need for main shrine and in the times of Emperor Constantine the Great in the time period between 319 and 333 AD there was built so called Old St. Peter’s Basilica. This was enormous building for its time – it was more than 103.6 m long, with an impressive atrium. This fine building stood here more than 1000 years. Nevertheless by the end of the 15th century the ancient basilica was in dire need for reconstruction. During the reign of Pope Nicholas V (1447 – 1455) it was decided that a new church or significant rebuilding of the existing one is needed. Of course, it had to be larger and more splendid than the old one. Some works were even started but when pope died, everything stopped. Pope Julius II (reigned in 1503 – 1513) moved the ambitious project further. He announced a tender for the largest and most splendid structure in Christian world. Many great designs were proposed by the best architects, engineers and artists of the time, with numerous innovations and lots of unseen ambitions. After lengthy discussions the design of Donato Bramante was selected. It took time to build the world’s greatest church, lots of time. Construction works started in 1506 and ended in… 1626. 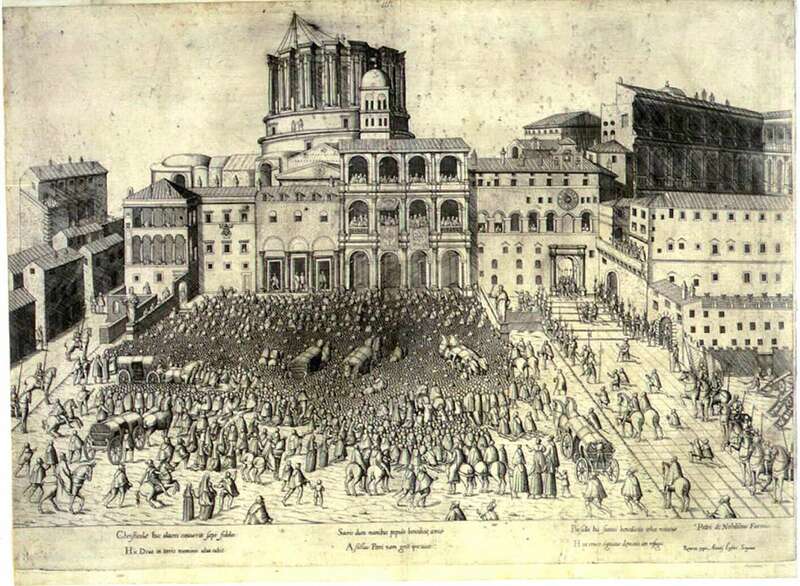 Design of Bramante was modified after the death of Pope Julius II in 1513 – and this was only the first change in plans. During its construction St. Peter’s Basilica saw many chief architects including the great Raphael who introduced nave with five bays (not realised) and Michelangelo. Although Michelangelo was not too happy to become an architect, Basilica to a large extent was shaped by him. Thus the great painter and sculptor can be listed also among world’s greatest architects. Such enormous deed left influence not only on the history of art. Soon after the start of the construction it became clear that lots of money will be needed – a lot more than Church had at the time. Financial geniuses of these times invented many sources of financing and one was: trade of indulgences in exchange of financial support for the construction of the new St. Peter’s Basilica. Marketing for these indulgences was ubiquitos – Pope desperately needed as much finances as possible. This rised protest and inspired Martin Luther to write his Ninety-Five Theses in 1517, starting the Reformation. Nevertheless works continued. 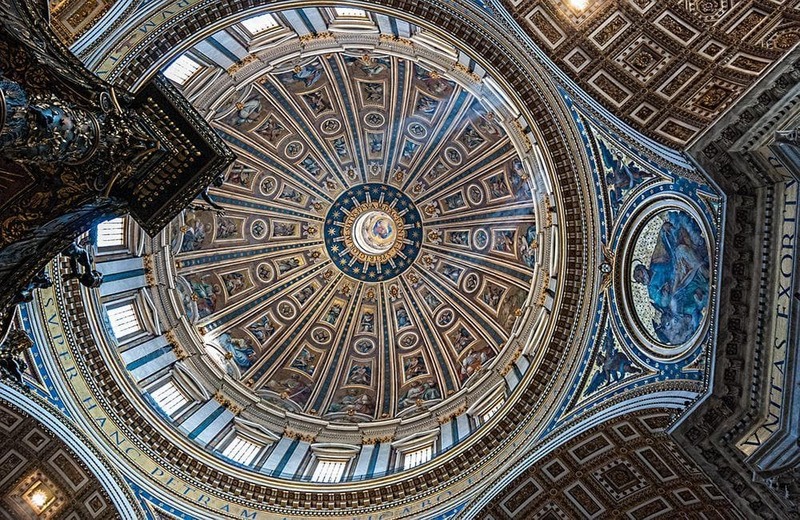 In 1590 was completed the dome – a wonder of structural engineering designed by Michelangelo. He did not live to see it: Michelangelo died in 1564. Later, in the middle of the 18th century the dome cracked and it was reinforced by heavy iron chains around it. Works continued also in the 17th century. After lengthy discussions it was decided to build nave and current facade towards St. Peter’s Square. The enormous (114.69 m wide and 45.55 m high) facade was designed by Carlo Maderno – and this part of the Basilica has been criticised ever after due to its inharmonious proportions. There were planned also two towers at each side of the facade. One tower was even built but the ground started to settle and thus the bell tower was demolished (designer Gian Lorenzo Bernini had to cover the costs of this demolition) and the idea of bell towers was abandoned. Long build history of St. Peter’s Basilica shows also in the architectonic style of diverse parts. While the dome of the church is one of the highest achievements in Renaissance architecture, the facade and nave represents slightly different age, with many features of the upcoming Baroque style. 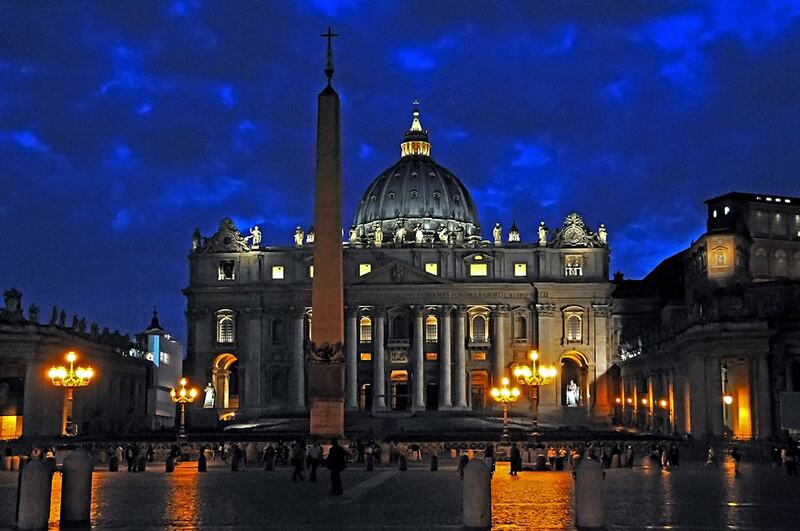 St. Peter’s Basilica is one of the largest churches in the world up to this day. It is the largest one by area (interior area is 15,160 m²), length (external length – 211.5 m) and volume (5 million m³ what by far exceeds any other church in the world). In the plan church has cruciform shape with a dome in the centre. This giant dome dominates the skyline of Rome. It is one of the largest domes in the world – the tallest in the world (136.57 m). 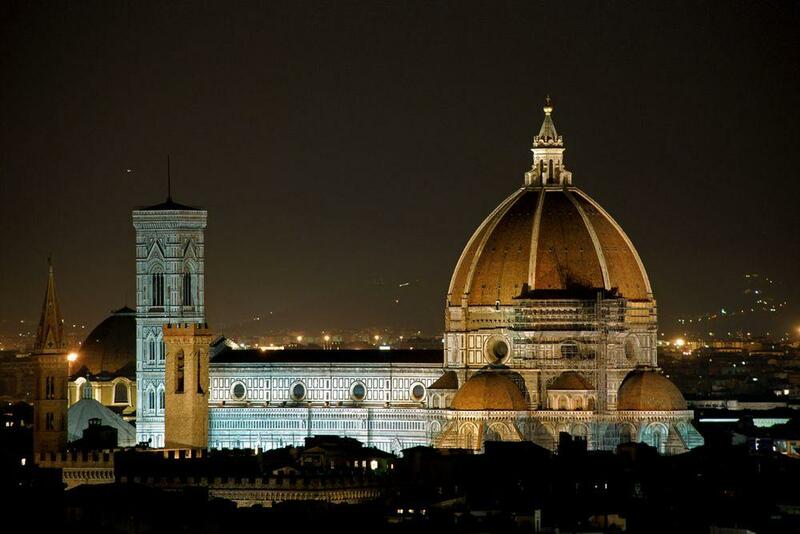 Diameter of the dome is 41.47 m – less than in Florence Cathedral but nevertheless it is one of the greatest domes in the world. In order to make it lighter, the concrete contains numerous pieces of the light pumice and tufa (ancient Roman formula, rediscovered for this case), it is also thin, with vertical and horizontal ribs to reinforce it (like in Pantheon). The design of the enormous dome was inspired by the Pantheon, but there were significant differences too. The enormous dome is resting on four piers and above it rises one more, smaller dome of lantern. 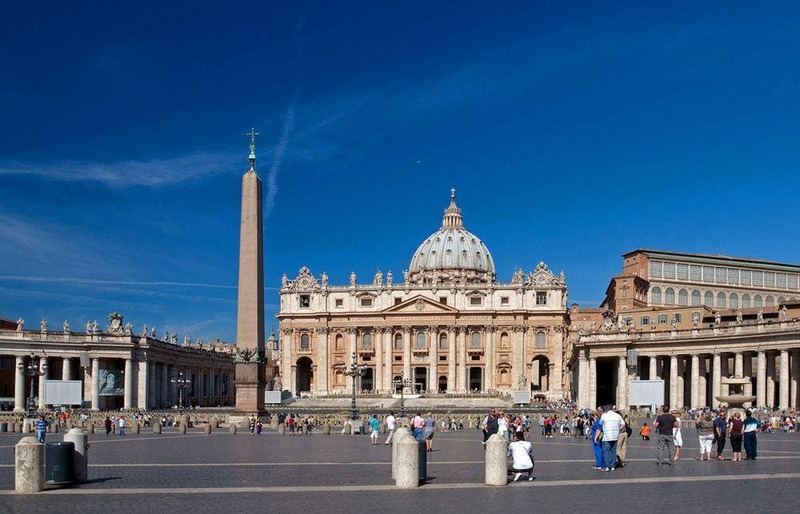 St. Peter’s Square is landmark by itself but to a large extent it forms the impression about Basilica. In its present shape the square was shaped in the 1656 – 1667 by Gian Lorenzo Bernini and is one of masterpieces of Baroque style. Bernini had to create an urban ensemble which is focusing the attention of visitors towards the basilica. Of course, he had to keep the Egyptian obelisk – an important landmark in the history of St. Peter’s Basilica. Bernini had different options to plan the square – square or trapezoid or any other shape. His solution though was diferent and innovative – he designed a space consisting of two elements: a trapezoid plaza at the basilica and an open space in elliptical shape further from it, around the obelisk. Thus Bernini managed to decrease the negative efects of the facade, seemingly making it narrower and taller. Both plazas are flanked by impressive colonnades. This ingenious solution was one of major manifestations of Baroque style in urban planning, with an intricate, harmonious play of different existing and newly added elements. After traversing the magnificent square one ascends enormous stairs flanked by statues of Saint Peter (to the left) and Saint Paul (to the right) and reaches the main facade of the church. The northernmost of the five entrance doors is the Holy Door – ornate (everything here is ornate) door which normally is sealed by mortar and cement. It is opened only on a special occasion: Jubilee years which are announced by Pope for the remission of sins. In earlier times these festivities took place every 33 – 25 years but sometimes more frequently. Well, in the 20th – 21st centuries Jubilees are more frequent – seems, there are too many sins to be remitted. Interior of the church is… incredibly vast. There are few buildings in the world with such a spatious interior and few – with such ornate interior. The size and beauty of the premises dwarfs the humans. It is that large that for visitors it is hard to get the sense of scale. The enormous nave is slightly tilted towards the Egyptian obelisk. Barrel vault of the nave is the highest in the world, with numerous impressive chapels found on both sides. Behind the high altar two staircases lead to underground chapel – Chapel of the Confession which is located above the purported burial site of Saint Peter. 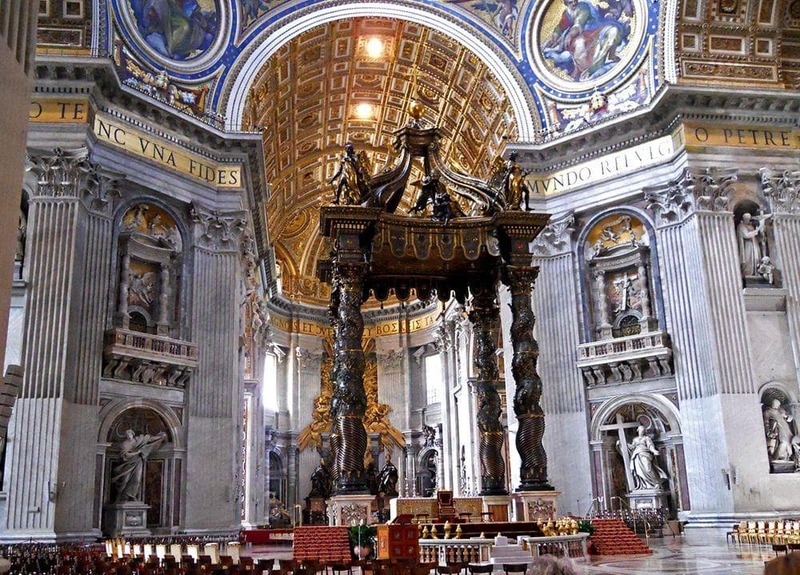 In the apse is located Chair of Saint Peter – a relic, legendary chair which according to legends was used by Saint Peter (in reality – a gift to Pope in 875 AD). Later it was used by many popes. After the use throughout centuries it became unusable – thus it was turned into a work of art. Now the chair is enclosed in a beautiful gilded casing (Bernini, 1647 – 1653) – an outstanding and innovative (for its time) example of Baroque art. In the Basilica are four precious relics – spear of Longinus which pierced Christ (although there are several more churches around the world which claim to have the same spear), the veil of Veronica with miraculous face of Christ, a piece of True Cross brought here by mother of Emperor Constantine – Helena and relics of St.Andrew, borther of St.Peter. Above the altar stands another outstanding work of art, the largest piece of bronze on Earth – 30 m tall, ornate baldacchino, also created by Bernini. 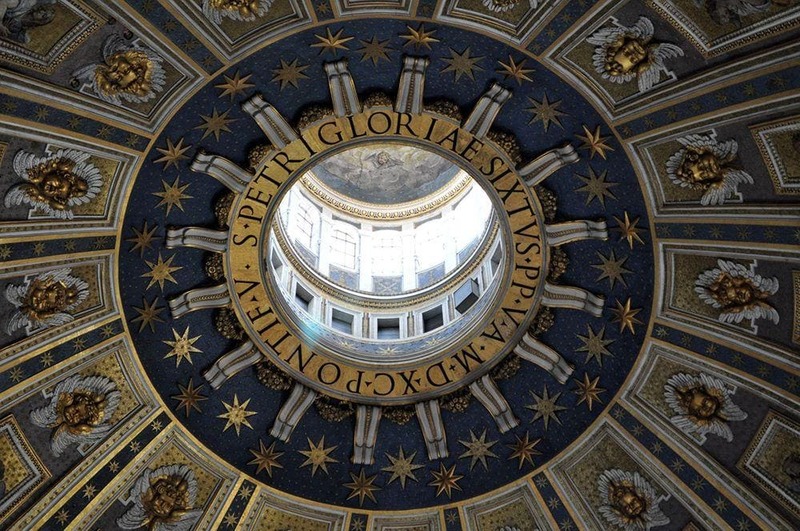 In the basilica have been buried numerous outstanding people – many popes and others, such as St. Ignatius of Antioch, Queen Christina of Sweden, composer Palestrina. 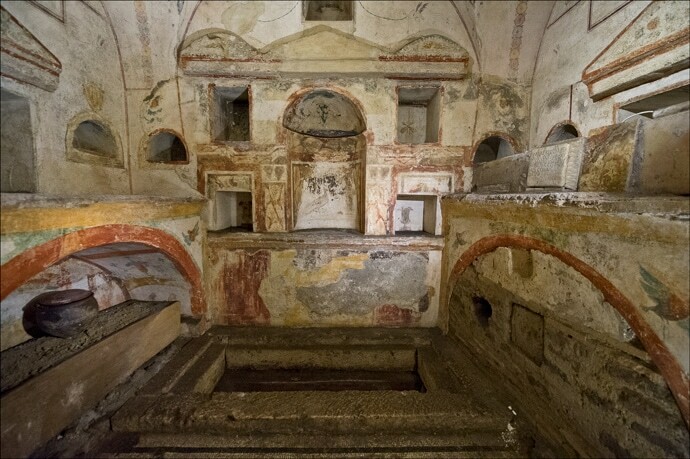 Many popes are buried in the ancient necropolis beneath the Basilica, just like (possibly) Saint Peter. Many burials are adorned with renowned artworks, such as Michelangelo’s Pietà. St. Peter’s Basilica has been a site of pilgrimage for centuries and continues to attract visitors from all over the world. Formally it is just one of four Papal Basilicas, but it is by far the best known and most important one. As it is next to the Papal residence and is very large, here take place most Papal liturgies. These liturgies draw the attention of thousands of believers and tourists, at times gatherings can have up to 80 000 people. Architecture and art of St. Peter’s Basilica has served as inspiration all over the world, influencing the views on art and the beauty of numerous generations. The design of St.Peter’s Basilica has influenced the design of such magnificent buildings as St.Paul’s Cathedral in London and Pantheon in Paris. Vatican is religious centre of global importance and in spite of its minuscule size here are located several landmarks of world importance. In fact these landmarks cover… major part of this country. 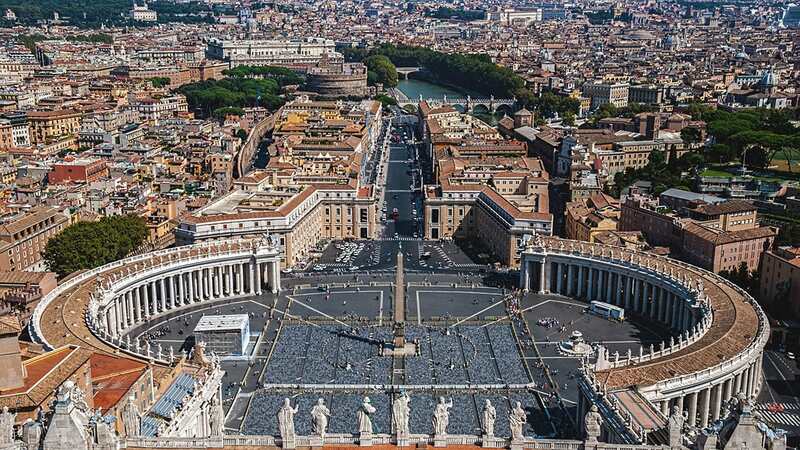 In Vatican are located several of world’s most important structures and artworks of Renaissance and also Baroque, such as the giant St. Peter’s Basilica and Sistine Chapel with its frescoes – some of world’s best known works or art. In this dramatic journey through religious and artistic history, R. A. Scotti traces the defining event of a glorious epoch: the building of St. Peter’s Basilica. Begun by the ferociously ambitious Pope Julius II in 1506, the endeavor would span two tumultuous centuries, challenge the greatest Renaissance masters Michelangelo, Raphael, and Bramante and enrage Martin Luther. 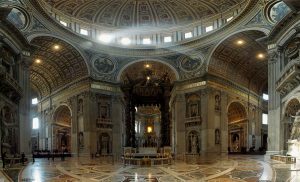 This is a quick guide to Saint Peter’s Basilica, one of the most amazing churches in the world. Many guidebooks only provide a very small explanation of all the artworks in the church and its complex history. This quick guide will give you detailed information about the most important artworks in and outside the church.